NOVEMBER 4, 2011: Phase III of Pension Reform has now passed the House with a unanimous vote to further alter the public pension benefit structure for future employees. In addition to future benefit changes (affecting those first hired on or after July 1, 2012), the House plan seeks a series of benefit enhancements for current retirees. NOVEMBER 4, 2011: A key component of the Pension Reform bill (H3787), passed by the House this past week, is the creation of a new retirement formula for those employees hired on or after July 1, 2012. Like the Senate, the House has also increased the full retirement age by 2 years for each group (67/62/57). 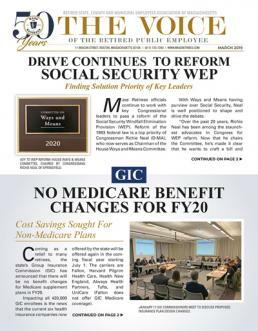 SEPTEMBER 2011 Voice: Determined to act this year on what might prove to be a generational change in our public retirement formula, Legislative Leaders are now drafting legislation that would serve as the third major pension reform measure passed in as many years. JULY 2011 VOICE: With over a half century of knowledge and experience working with our public pension laws, Association President Ralph White is widely respected when it comes to our state's pension policies. Having led the Association since 1968, he has also had a hand in formulating the state's renowned defined benefit (DB) pension plan. JANUARY 2011 VOICE: Six intrepid local retirement boards have broken the ice which had restricted the pension COLA base to $12,000 since 1998 - twelve years ago. This change in the law, which allows a higher base option, was made possible by the passage of Chapter 188 of the Acts of 2010, enacted by the Legislature and signed by the Governor this past July. The new law also allows boards to extend their debt funding schedules to a maximum date of Year 2040, in order to reduce annual appropriations by their community or county. 2007 JULY - Seventy-Eight Systems Implement Entire Law - It’s been 18 months since the local option law, Chapter 157, was enacted, that allows local retirement systems to finally allow their accidental (work related) disability retirees, who are veterans, to receive the same vets stipend, up to $300 annually, that superannuation retirees have long received. As for the state and teachers’ retirement systems, their accidental disability retirees are receiving the same vets stipend under a separate law – Chapter 161.
received by their widow (or widower) if the retiree died from their disability. was done by Buck Consultants.